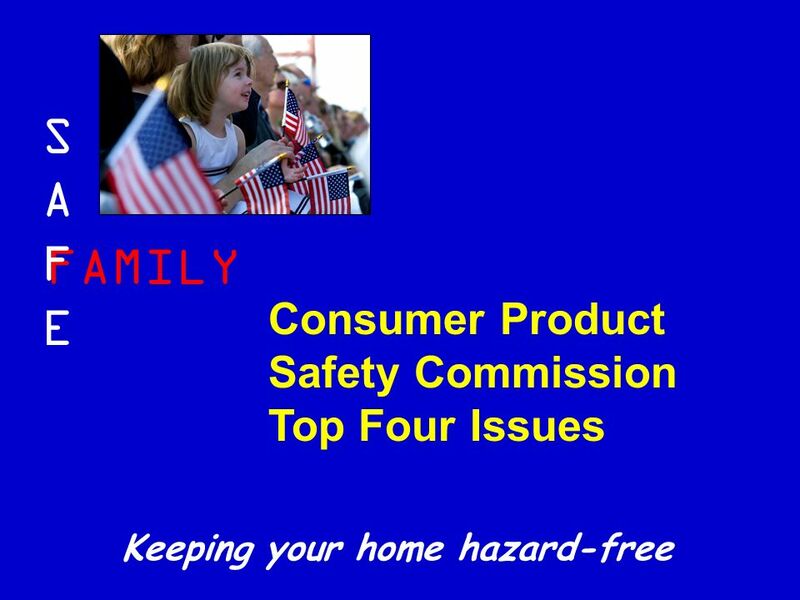 FAMILY SAFESAFE Keeping your home hazard-free Consumer Product Safety Commission Top Four Issues. 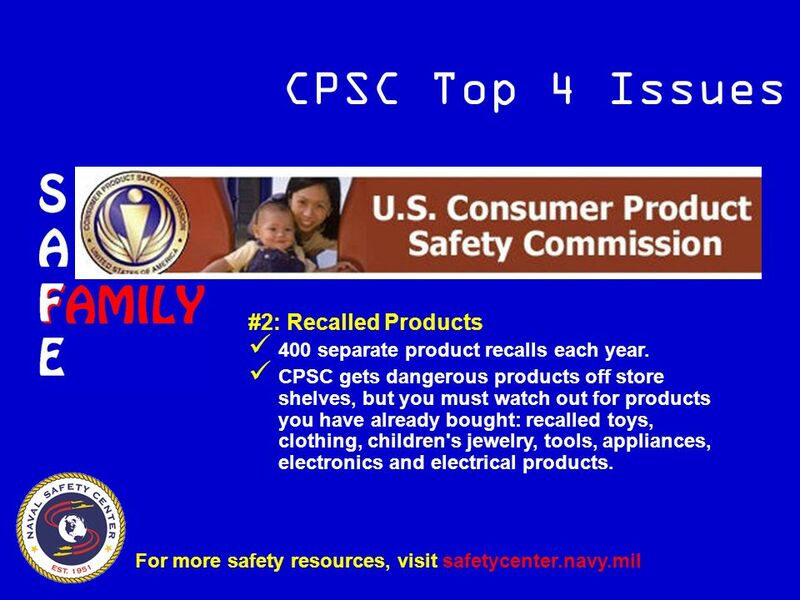 Download ppt "FAMILY SAFESAFE Keeping your home hazard-free Consumer Product Safety Commission Top Four Issues." FAMILY SAFESAFE Keeping your home hazard-free Poisons. S A F E FAMILY Electrical Safety Keeping your home hazard-free. FAMILY SAFESAFE Keeping your home hazard-free Extension Cords. FAMILY SAFESAFE Keeping your home hazard-free Fire Extinguishers. FAMILY SAFESAFE Keeping your home hazard-free Swimming Pool Safety. FAMILY SAFESAFE Keeping your home hazard-free Lawn Mower Safety. FAMILY SAFESAFE Keeping your home hazard-free Food Storage. FAMILY SAFESAFE Keeping your home hazard-free Kitchen Fires. Bathroom In the bathroom children can… Drown in the toilet or tub Bump into the hardware Be electrocuted by hair blowers, etc. Be poisoned by medicine. 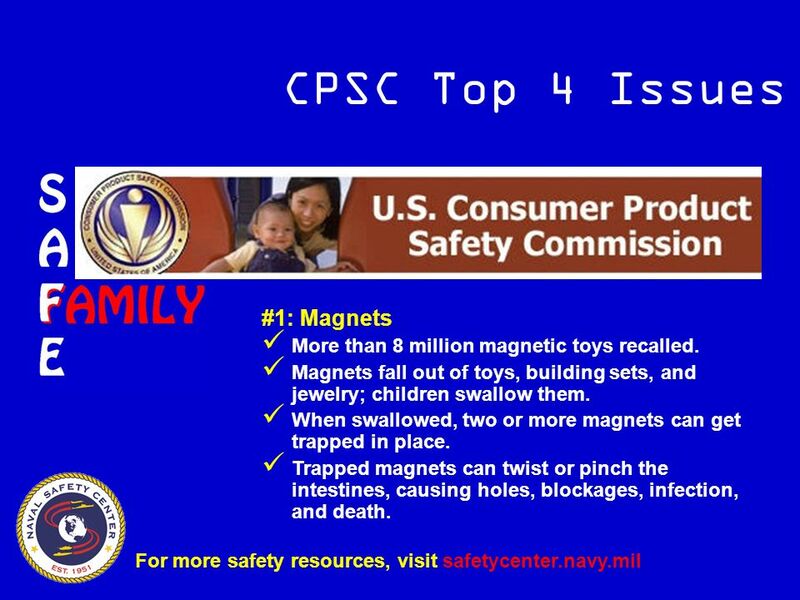 Childproofing One million children aged 14 and under go to the emergency room every year for injuries in the home. FAMILY SAFESAFE Keeping your home hazard-free School Bus Safety. 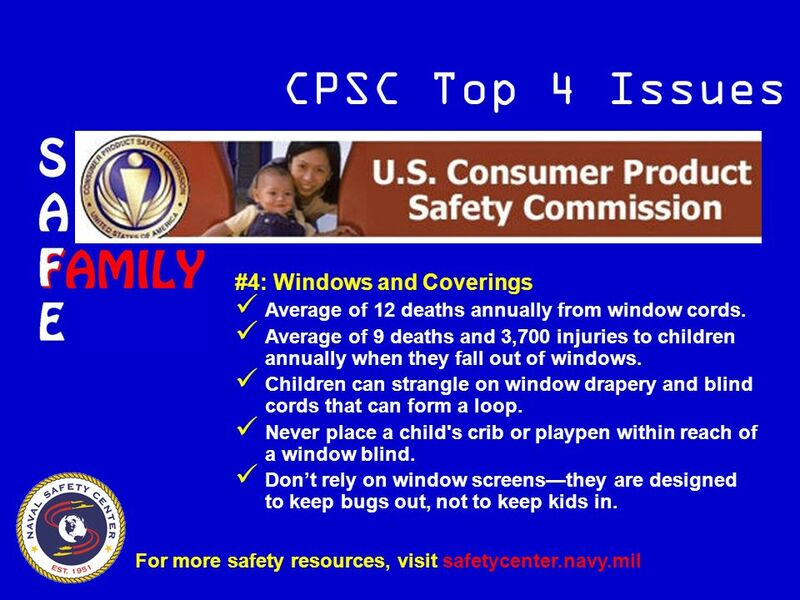 Infant/Toddler Safety. Fall Prevention Tips for fall prevention: Never leave infants alone on changing tables, beds, sofas, etc. Always strap children. Legislative Advocacy Talk Kristen Schratz, Becky Tamez & Andrew Wehrman ReCALL ME MAYBE: Children’s Product Recalls. Playgrounds are one of the most important places in a child's world. They provide children with opportunities to socialize, exercise, and have fun. Playground. 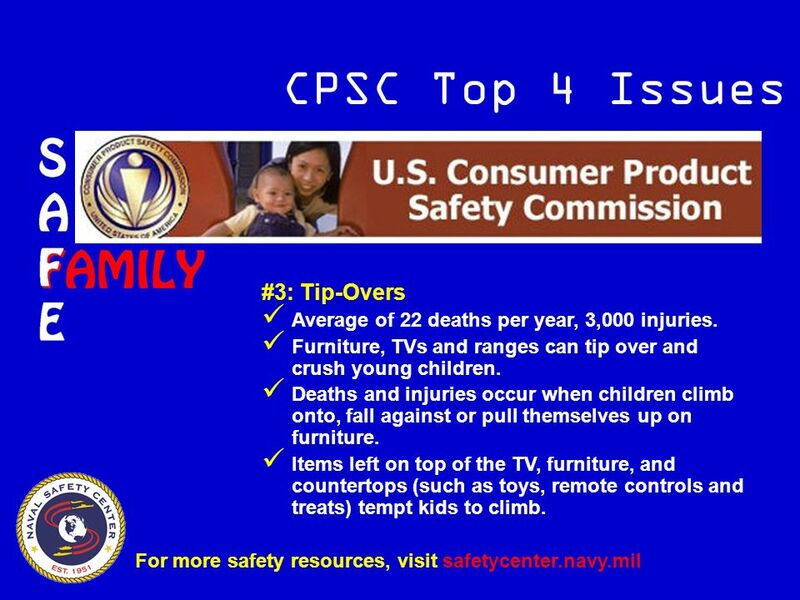 PCD Objective 2.02 Ways to Prevent Injuries at Home. House Bath CribHigh Chair Stroller Walker 10 20 30 40 50 40 30 20 10 50 40 30 20 10 50 40 30 20 10 50 40 30 20 10.